Discussion in 'Coventry City General Chat' started by Nick, Mar 22, 2019. She's trying to blag a couple of freebies for tomorrow. "Listen Joy, I know it might not be fashionable but I just like my central midfielders to sit deep and break up attacks." Mr Dave, shmmeee, better days and 4 others like this. 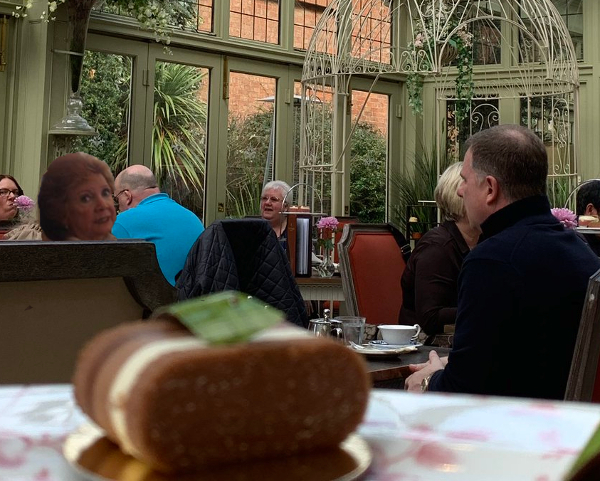 The woman in the background to the left has a mouthful of food and has clocked the picture being taken. Mr Dave and AStonesThrow like this. Surely they wouldn't be talking about things that important / confidential somewhere so close to others? The people next to them can probably hear everything being said. sw88, chickentikkamasala, RoboCCFC90 and 6 others like this. She knows what's going on but it's too late for her to do anything. "This will be the new changing rooms. Over there the Director's box and we'll squeeze the away fans into that corner"
Right, Coldwar Steve style is called for. Terry Gibson's perm, Sick Boy, shmmeee and 3 others like this. I heard they've gone to meet Dale Evan's about an investment into building a new ground. sw88, AStonesThrow and CanadianCCFC like this. She's looking desperate there, looks like her hairs falling out. Speaking of whom, he has just come out of the woodwork and posted a comment on the 2-0 U23 score line status update on the official Coventry City FC Facebook page. ccfcrob, shmmeee and AStonesThrow like this. Didn't he take a swipe at the council on the way out last time? sw88, chickentikkamasala, RoboCCFC90 and 15 others like this. He will be telling her he is off to manage Ipswich in the summer if she cannot guarantee playing at the Ricoh for the next two seasons. Captain Dart and singers_pore like this. Yep. Said something along the lines of ‘this club will never be able to progress unless the council support the owners’ but people forgot about that and said he left because of sisu. A career with MI6 beckons! chickentikkamasala, RoboCCFC90, OtiumForTheMasses and 17 others like this. Hoffman / Elliott / Ranson / Overson / Evans consortium anyone? sw88, Moff, RedSalmon and 13 others like this. Have a look at that picture again, it’s Cilla reincarnated. Just when you think things cant get worse and are surreal enough Walter Mitty Dale Evans turns up .......................... great At least surely no one will take him seriously will they? Is that olive from 'on the buses'?